Breathe the freeze with the introduction of the Mya Freeze Hose. 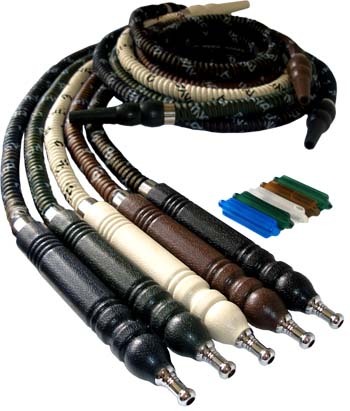 This wide body washable hose is designed for everyday use, as the inside lining of the hose is made of a durable leather material that will not deteriorate in quality. To avoid rusting, the Mouth Tips are made out of a plastic material and are coated in order to repel water. In addition, the extra wide thickness of the hose allows for the smoke to pass through easily and effortlessly for a smoother smoking experience. 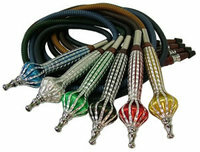 The Freeze Hookah Hose is unique as the plastic handle can be unscrewed and a non-toxic ice packet can be inserted into the handle and then screwed back together to create a cooler smoke. The non-toxic ice packets act just like ice cubes when frozen, allowing the smoke to cool when passing through the ice chamber. This cooling effect creates one of the smoothest and coldest Hookah smoking experiences available. Unlike other Ice Hookah Tips in the market, this Freeze Hookah Hose (Ice Hookah Hose), comes as one complete kit (Complete Hose and Two Ice Packets) and the ice packets are much smaller and can easily be stored in a freezer without taking up too much room. The Freeze Hose is also much more affordable, includes a spare ice packet, and does not require the use of mouthpieces at the end of the hose. Choose the Freeze, not the frost bite! If you are looking to order replacement ice packets for the Mya Freeze Hose, Click Here to view the Mya Icicles Set.